This Autoflowering Cheese Cannabis strain is the most popular to come out of the Exodus Crew, a collective of people who used to be based around the Luton areas. It was originally a Skunk #1 phenotype that exhibited an extraordinary smell of vintage Cheese. Maintained in clone form for many years by anyone lucky enough to get their hands on it eventually it was hybridised with Afghani #1 and seeds were produced. It quickly became one of the Top Ten strains sold in all the coffeeshops in Amsterdam and won numerous awards in the High Times Cannabis Cup. 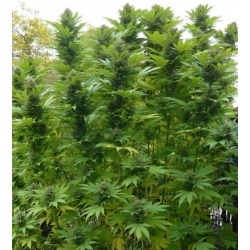 Autoflowering Cheese produces a well balanced effect, a physical and cerebral mixture. With 8 week flowering and lush heavy harvests. Its aspect is languid, with long outstretched leaves and slim stalks, an heirloom from its skunk ancestry. The flowers are thick and plentiful and when exposed to the adequate low temperatures, obtain a light violet colour. Autoflowering Cheese can be classified as a highly commercial variety, comparable to Big Bud, Skunk #1, Power Plant, or Critical+.These varieties, together with Cheese, are quick and compact heavy yielders.